Minecraft is a sandbox indie simulation game published by Mojang and fully released on the PC in 2011. In this 3D generated world, players can assemble structures with blocks, gather resources, go exploring in cave systems, craft items and fight monsters. 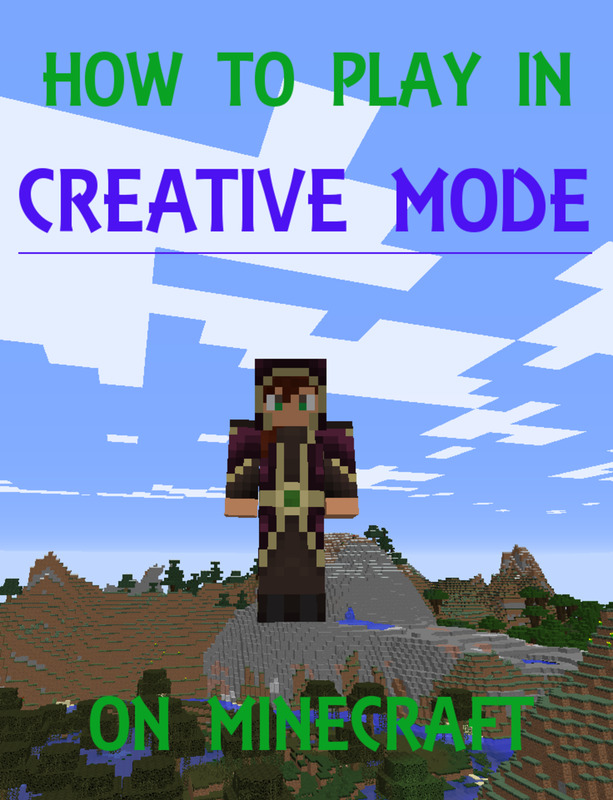 Survival mode pits players against mobs that spawn at night whilst maintaining their stamina and hunger bars, while Creative mode allows players infinite access to blocks, as well as no hunger and the ability to fly! 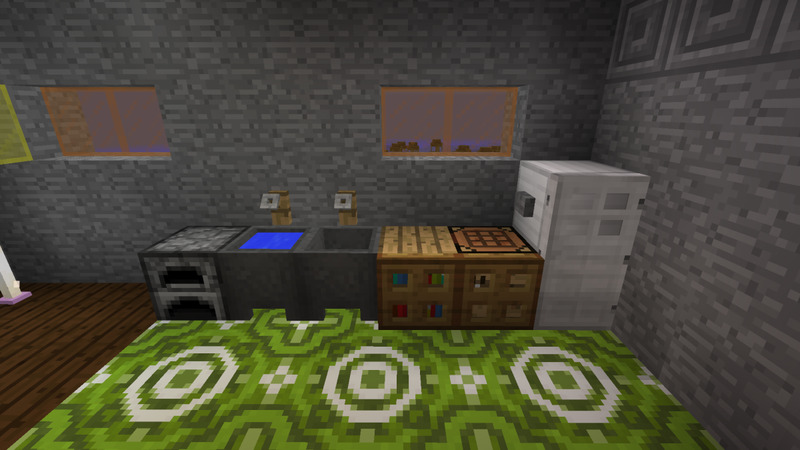 Building a home in Minecraft takes different priority depending on the player; some people are perfectly content living in a small, unfurnished shelter, while others take pleasure in constructing a more permanent home. Building enthusiasts are often seeking ways to improve the appearance of their houses. 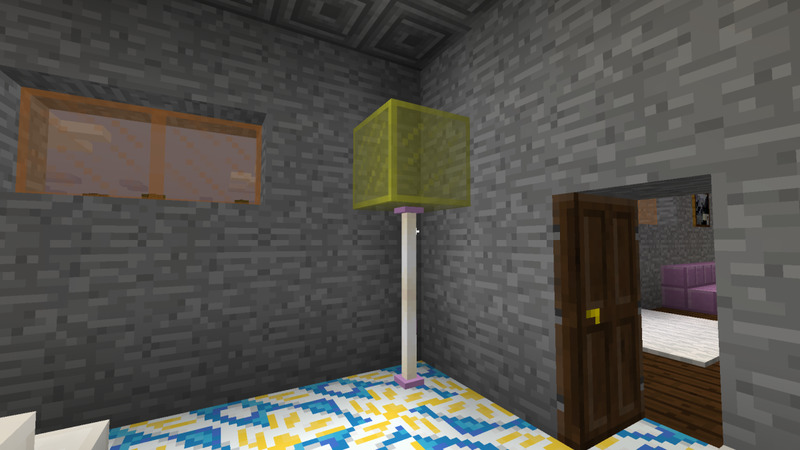 While Minecraft doesn’t contain many furniture items, it is easy to recreate indoor décor with basic materials. 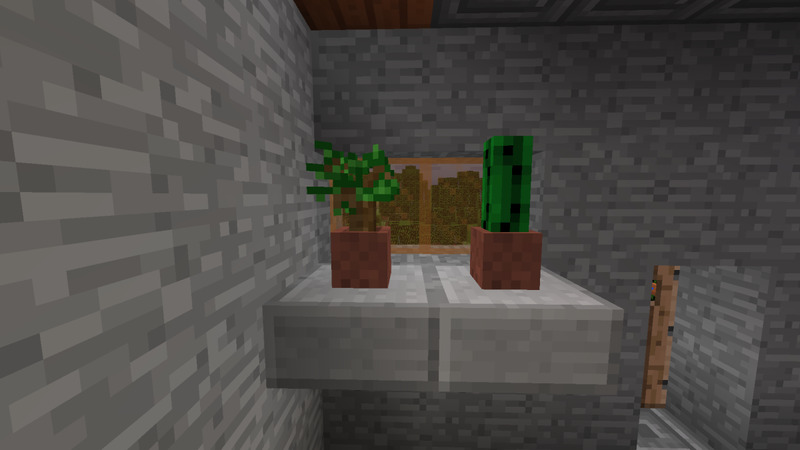 To date, Minecraft has been updated with numerous decorative items; pots allow players to display saplings and flowers around the home, while paintings make walls look less bland. Item frames allow players to display their favorite items on the wall, and stained glass windows add sophistication to to the most simple houses. However, there are many furniture items that the sandbox game is lacking. For example, there is no recipe for tables or countertops. Hygienic items like sinks, toilets and showers do not exist as there is no functional need for them. There are no chairs or couches to sit on. Nevertheless, Minecraft’s creative nature has allowed players to replicate these items with basic materials. The living room is the center of the home in our non-virtual world - we use them to host parties, watch television, relax with the family and take a seat after a long day. 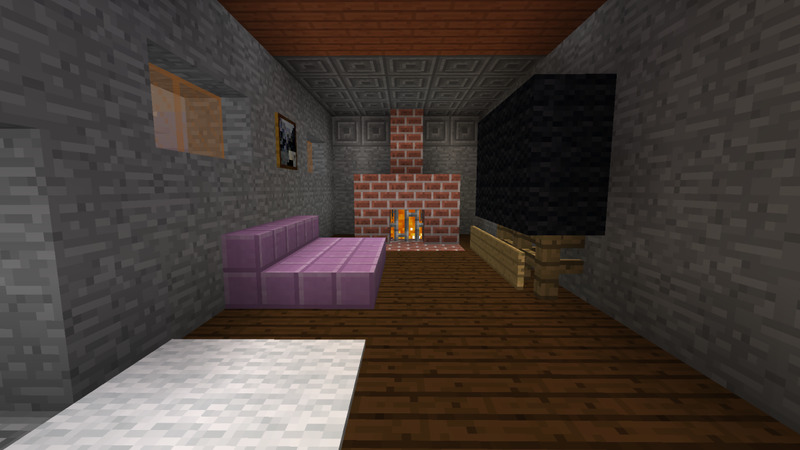 Do you want your Minecraft living room to be warm and welcoming, or new and modern? No matter how you envision your house's living room, there are a few basic items that should be included. Couches: Couches are a big part of living rooms and are easily replicated in your Minecraft home. You can make a couch by placing two or more stair blocks next to each other. Placing slabs in front of the stairs make it look longer! You also can use slabs surrounded by wool blocks for a fancier and fluffier-looking couch. Tables: Tables and end tables are great additions to any living room. If you have a couch already built, try making a simple coffee table out of slabs in front of it. A fence post with a pressure plate on top makes a great small end table, as well as an activated piston. You can also place different colored carpet on top of an anvil - experiment with what you like best! Television: A living room isn't complete without a television for you and your friends to watch! 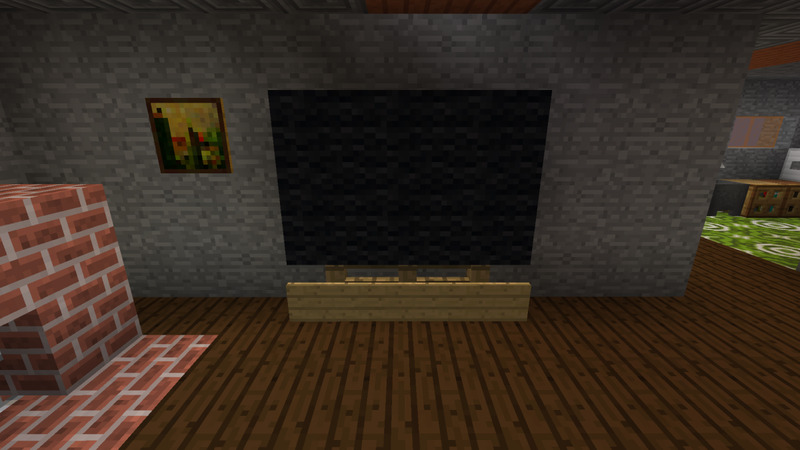 The easiest way to build a television is to place four or six blocks of black wool (or obsidian) together. Try building a table underneath it with fence posts and signs to look more fancy. Your T.V. won’t be functional, but it will be the talk of the village! Fireplace: Do you live in a winter biome? Try building a fireplace! Keep in mind that certain materials (like wood) catch fire easily and should not be used on your fireplace. Your best bet is to surround a block of Netherrack with stone or brick blocks; Netherrack will burn constantly, and materials like brick and stone are fire-proof. Kitchens are fun to make - they provide a cozy place to store your food, as well as a decorative table, countertops, sinks and more. As with our own homes, kitchens can be small and cozy, or large and spacious. The options are endless, so try messing around with many different styles and furniture items! 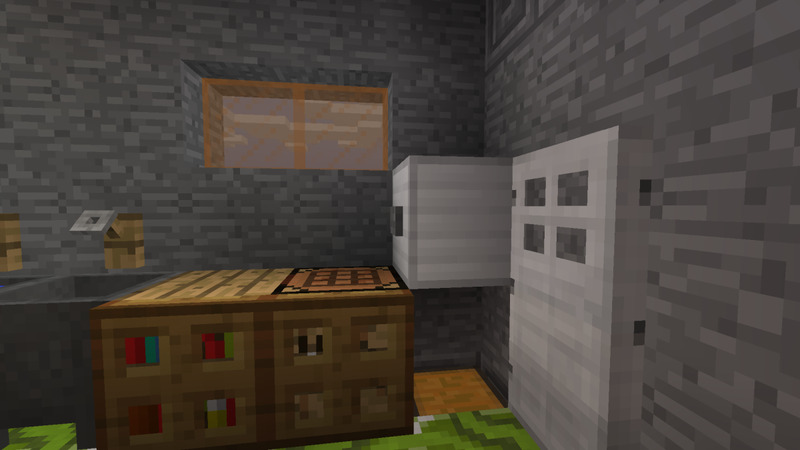 Refrigerator: While a refrigerator isn’t an available item in Minecraft, it is simple to replicate it with basic materials. The best method is to dig down one block where you want your fridge to be. 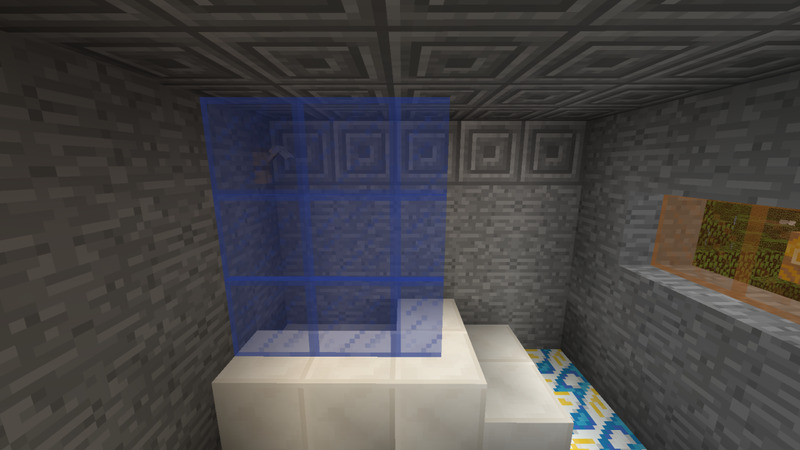 Put a chest in that hole, leave the block above it blank, and place one iron block above that. Place an iron door in front of your fridge, with either a lever or button on the iron block to open the door. Sink: A sink is not only a decorative item to have in your kitchen, but a great place to store some water on-hand. To make a simple kitchen sink, place down one cauldron, fill it with a water bucket, and place one tripwire hook above the cauldron to represent the faucet. You can place two cauldrons next to each other if you want a double sink! Tiles: With the addition of glazed terracotta, you can now have a tiled kitchen floor. Pick a color and place the blocks so the designs match up; matching the patterns in the glazed terracotta above created a circle pattern. If you prefer to keep things simple, wool is a good tile alternative. Try using different colors to make your own pattern! Countertops: Every kitchen has countertops - where else are you going to prepare your food? To create a simple cupboard, just place one bookshelf block, and put a wooden trapdoor on the side of the bookshelf facing you. Whenever you open the trapdoor, your shelves will look like they are full of items! You can use wood planks for simpler approach. Stove: Lucky for you, there is already a stove in Minecraft; for a fully functional stove, just use a furnace in your kitchen. Try adding a crafting table as well to make your kitchen completely functional. The bedroom is the sanctuary of every home - it’s a place for personal space, quiet and retreat. It is where we keep our most personal belongings and rest when we are weary. While you can already craft a bed in Minecraft (with three blocks of wool and three blocks of wooden planks), you can still have fun decorating your room with a dresser, closets and more. Dresser: A dresser holds our clothes, personal belongings and other apparel. To mimic the appearance of a dresser in Minecraft while maintaining its functionality, you can place two long chests on top of each other. A long chest is made by placing two chests adjacent to each other; this doubles the space the chest can hold, as well as its length. Closet: Another functional feature of a bedroom is the closet. 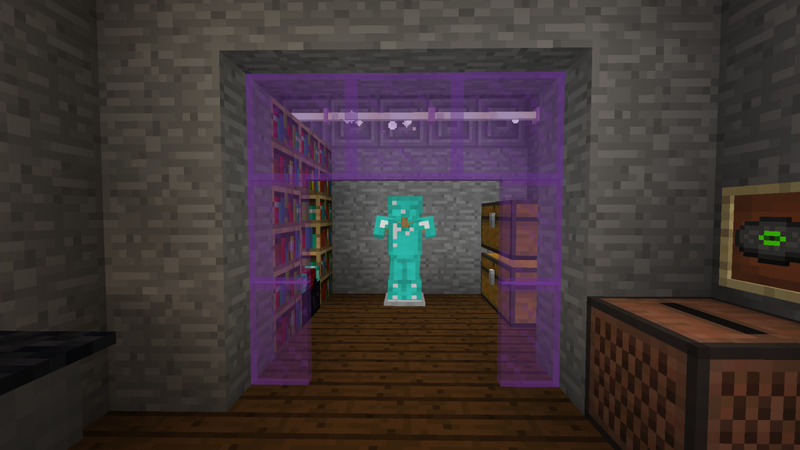 You can build a closet in Minecraft for decoration, or fill it with chests or other items. To make a closet, dig one block deep and two blocks high into the bedroom wall. If you prefer, you can make the closet wider, deeper or taller - you can even have a walk-in closet! Placing stained glass panes around an opening can mimic a colorful curtain. 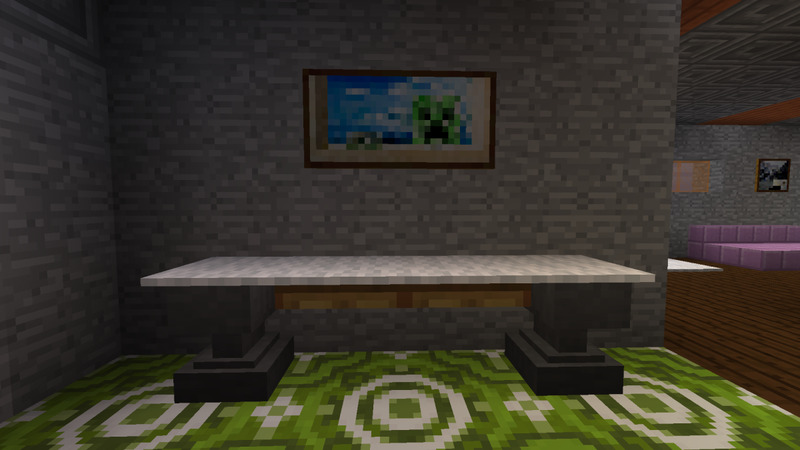 Desk: You can also build a desk to do your very important Minecraft work at. An easy model of a desk is built the same way the tables were in the living room - place two fence posts next to each other with wooden pressure plates (or wood slabs) on top. Alternatively, place a wooden trap door between two anvils, and cover the surface with carpet. While you can’t put anything on the desk, it still makes a nice addition to the bedroom. Finally, no home is complete without at least one bathroom. 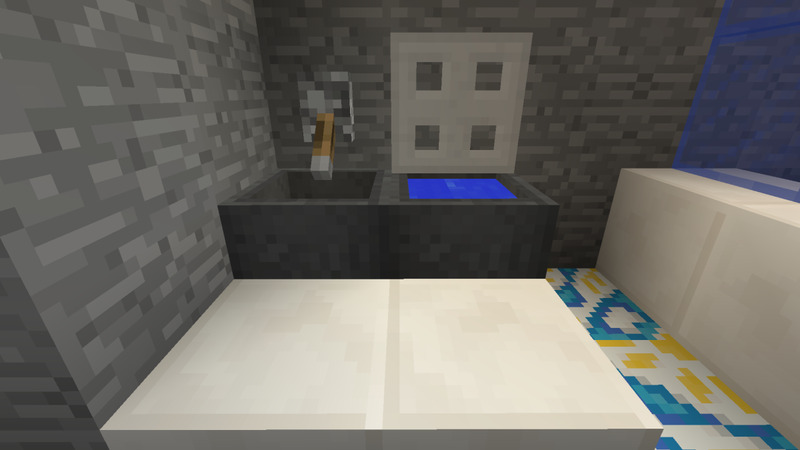 While having no functional use in Minecraft, bathrooms make a house look complete and are a great place to dump your unwanted junk items, like gravel or excess cobblestone. With some basic materials, you can build toilets, showers, sinks and more. Toilet: The toilet is the most important part of any bathroom. To create a realistic toilet, put down a cauldron, fill it with a bucket of water and place a trapdoor on top. When you open and close the trapdoor, it acts like a toilet lid. You can also use your toilet to dispose of unwanted items - simply drop the blocks into the toilet water and they will despawn after five minutes. Sinks: Bathroom sinks are similar in appearance and functionality to kitchen sinks, but usually look more aesthetically pleasing. Try placing a cauldron next to the toilet and putting a stone slab in front - whatever matches your bathroom best. From here, you can either place a tripwire hook above the cauldron to represent a faucet, or use a lever. A lever next to the toilet's trap door will open and close the lid! Shower: You can put together a shower that is either functional or decorative. Start by outlining the edge of the shower with slabs or blocks. You can leave the shower open, or place some glass panes to give it a closed-in look. Place a tripwire hook on the top of the wall inside the shower for a faucet, or place a block of water in the ceiling above a piston; activating the piston will open a hole in the ceiling and rain water down! Do you decorate your Minecraft homes? 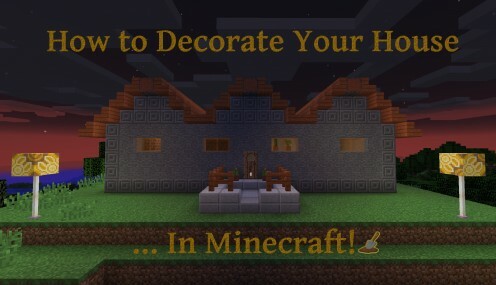 Remember that this article isn’t an end-all for decorating your house in Minecraft. The majority of these designs are quick and easy; if you have an idea to make something fancier or more detailed, go for it! 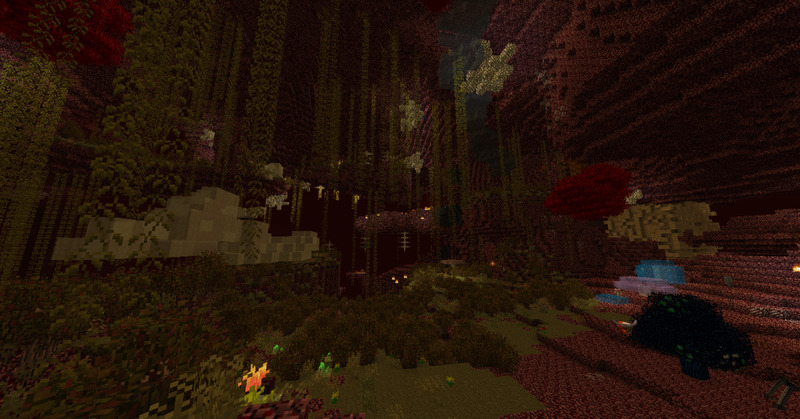 The creative possibilities in Minecraft are endless, so don’t be afraid to experiment. And feel free to share you own furniture designs in the comment section below! Check Out Mr_Crayfish's Furniture Mod! Not up to creating your own furniture with basic blocks and materials? Mr_Crayfish's Furniture mod adds over 30 different pieces of furniture to Minecraft, including chairs, lamps, cabinets and refrigerators! How did you get all of this stuff to decorate your house in Minecraft? Every item is something that can be found or crafted in vanilla Minecraft! Some materials may be harder to get than others, but it is totally doable with some patience and creativity. How can villagers kill you in Minecraft? If they are turned into zombie villagers, they act just like zombie mobs and will attack you! How do you decorate a cave? However you like! If you like that natural look though, you can do potted plants along the walls, dig paths into a dirt floor to make it look like carpet, break blocks in the walls at intervals and put torches inside. These are just a few ideas, but it's up to you! What should I make or build in my minecraft home? It's up to you! 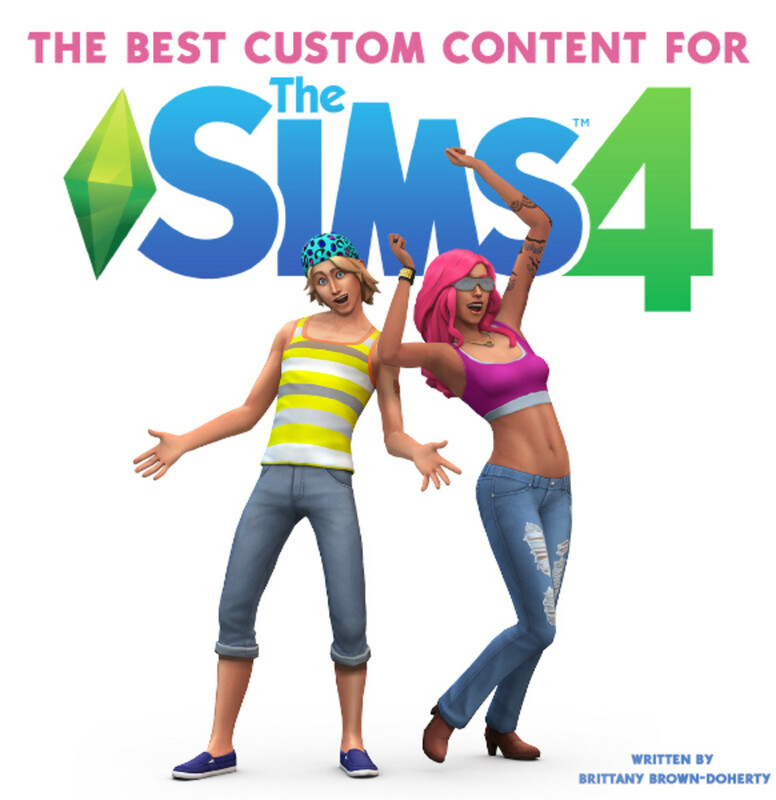 You can try some of the furniture items in this hub, or make up some of your own. @Shikiri I'm glad you like them! With all the new blocks they recently added, there's even more fun decorating you can do! @M Thank you for reading! @Sean Thanks for reading! I'll work on more hubs grouped around this topic in the future. 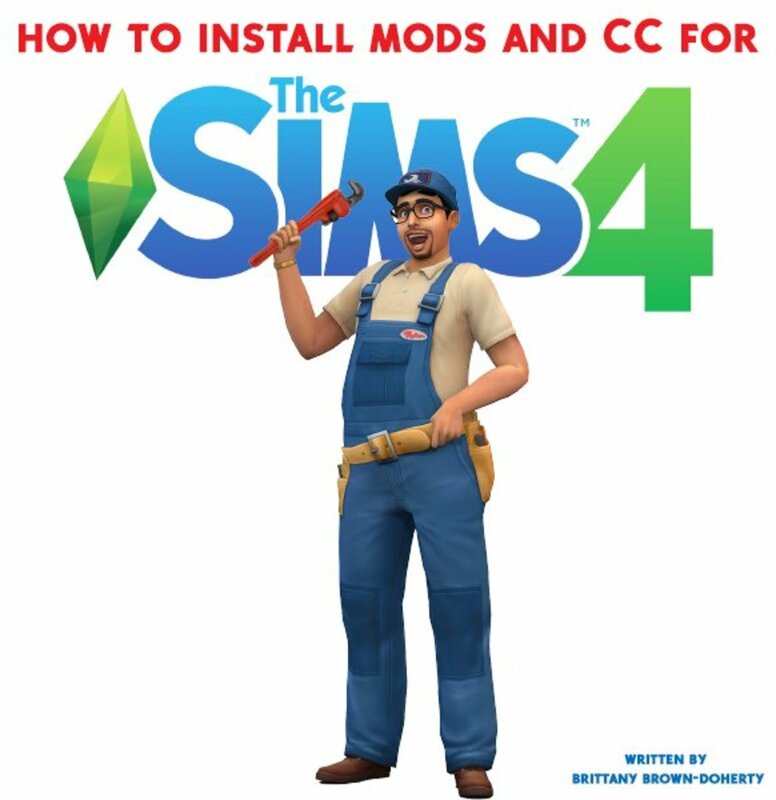 There have been some pretty decent changes to MC since this article was originally posted. One hopes to see more on this subject in the future. Great job! Woah! Used all the designs, thanks! I like playing Minecraft but I tend not be very creative. I mostly explore and fight things. Nice Hub. @L And you're entitled to your opinion. Thanks for reading! @Coffeequeen It can be! There are several ways to play it, which helps it appeal to a lot of different players. To be honest, I've never played Minecraft before, but I know it's very popular. It sounds really interesting. @Rachel Moore No problem - thanks for reading! I am new to Minecraft and love it! Thanks for the ideas!! @Carlsincharge This hub is in reference to decorating in unmodded Minecraft. I do agree that there are some great furniture mods out there! no offense, but that décor is really bad in my opinion............ Check out Magmamusen's cool and awesome stuff! Great hub Jessica. It's useful for those who know how to play it. Voted up! @aalite Thank you! You know us, we love to decorate! @SusanDeppner Thank you so much! Hmmmm.....I'm sure I've seen this kind of stuff somewhere......Congratulations on the HOTD! I don't play Minecraft (or anything else), but what a fun project to read about! Congratulations on your creative Hub of the Day! @DreamerMeg Maybe you should! I don't own the tablet version, but you can do many of the same things as on the computer. @VenkatachariM Thank you! I love customizing structures in Minecraft, it is practically limitless. @ladyguitarpicker Thank you! 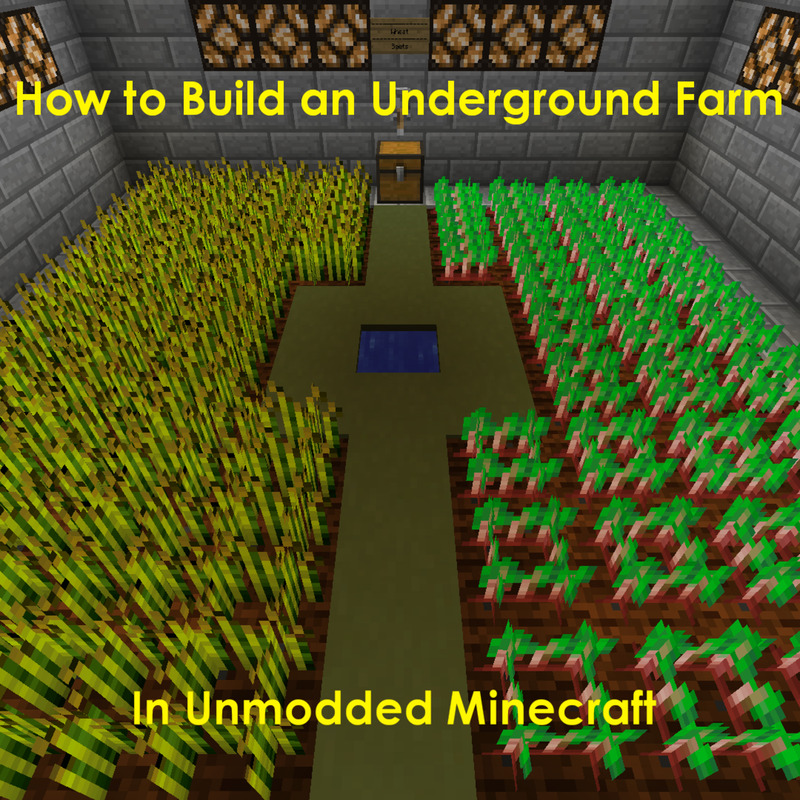 Minecraft can be really educational. @davidlivermore On a server I frequent, I helped build a house around a tree. I love stuff like that! @KristenHowe Thank you so much! It really is a fun game to play. @RoadMonkey Thank you! 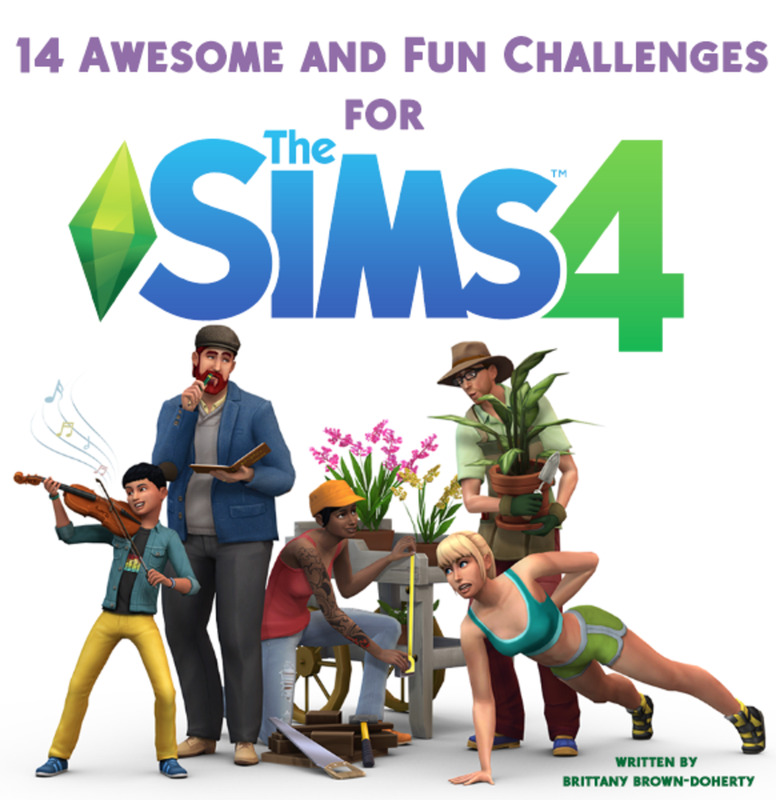 It is a really versatile game - there are so many ways you can play it! I think I must try minecraft. I downloaded a book to my Kindle on it and it sounds interesting. Your hub makes me want to go and try it out NOW! 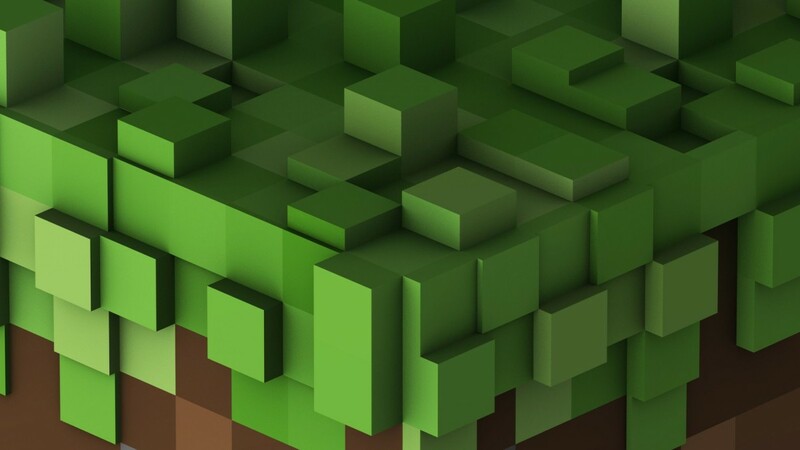 I've never played minecraft though my granddaughter says some of her friends play it. I like building things like that, maybe I should download it to my tablet. Interesting and fantastic. I never heard of such games. This is great. Even you can get ideas for your real home decoration from such things. I always grew trees and had water in my Minecraft house. Was quite fun. Jessica, I never heard of minecraft. This sounds like a fun game. I've heard of Sim City games like this in the past. Well written and congrats on HOTD! Voted up for useful! @miss b: Oh, thank you so much! If I come across anything else, I will revisit this hub and add more pictures. My Favourite was the fridge. I think it's very creative and I love how you have presented it. @ForLoveofCupcakes: Thanks! They aren't all my designs, no; I gathered the best from around the internet. There are many that I have been doing before researching this hub, like the kitchen sinks, tables, chairs, and fireplaces. And the frames are called Item Frames - they are crafted by surrounding 1 leather with 8 sticks in a crafting table. You can hang them up, and insert items by right-clicking on the frame with them in hand. P.S. How did you frame those items? @SimilarSam: Thank you! I don't always decorate this well either, if I have the time after setting up a farm and gathering animals I focus more on the house. I just have the most fun doing the farm thing first! These are really creative ways to decorate! All I ever do in Minecraft is place a bed and a painting if I'm feeling really decorative... Definitely putting my houses to shame! Thank you for the feedback! I loved having a fridge that was more or less "functional". It made the kitchen feel more homey. This is a very creative hub, for all those Minecraft fans! The pictures you provided are very useful, I know many people who will enjoy reading this. You have some great ideas, I like the fridge and countertop idea. Minecraft has a wealth of possibilities, the sky is the limit. Excellent hub, voted up +++ and useful. I'm sharing this. My kids love Minecraft, lol. This is great, it's making me want to play. 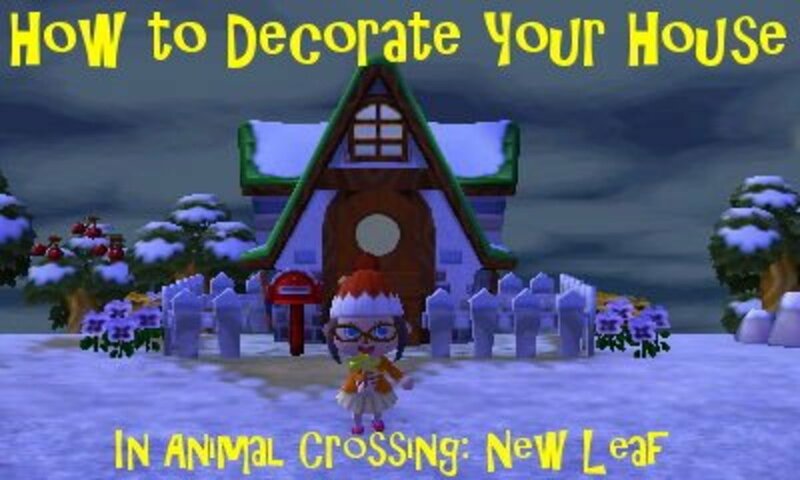 I love decorating, I love those virtual house decorating websites and all. Maybe I should start this. Nice work, great hub. Just dropped by to tell you 'well done' -it is an excellent piece of work. Thank you so much! I appreciate the feedback. Another excellent work from you. Although I do not play this game app, I enjoyed reading this very clear and simple article on 'how to..' Congrats on your Grand Prize Win. Excellent hub ... great illustrations, well written and organized! I must look around my house and be more creative. Thank you! It isn't something I do all the time, but when I think a room needs something extra it doesn't hurt. Especially if you are playing with friends and want to "invite" them over. I sincerely appreciate your feedback! Not a subject I'd normally read about, but when I saw you'd won the Grand prize to the Hubpot Challenge, I thought I'd better take a look. Great article, well written and perfectly presented. For any Minecraft disciples, this would be a worthwhile read; and if I ever play it, I'm gonna furnish my house. Congratulations. Voted up and awesome. Very creative alternatives! I'll admit, my minecraft homes are pretty basic. I love building elaborate defense walls to keep out things at night, but other than that every house is just a bed, crafting table, furnace and chests. These things could really give a place personality. Great hub!